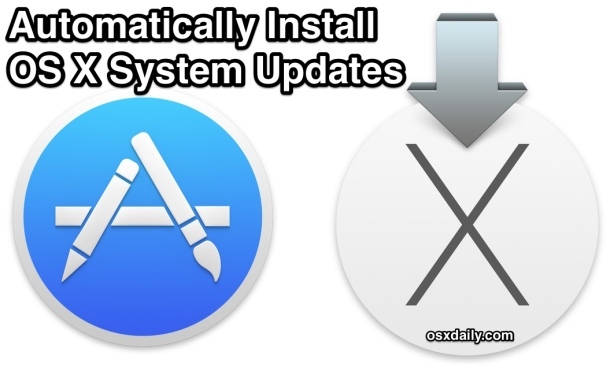 Automatic Updates has been possible for Mac apps for quite some time, but up until now the system updates of Mac OS X were not part of that automatic installation option. That changed with Mac OS X Sierra, Yosemite, and El Capitan, and now Mac users who would rather take a hands-off approach to maintaining their Macs OS X software updates can choose to automatically check for and install core system updates. This is in addition to the existing options for automatically updating their Mac apps and installing important security updates too, making some of the more important maintenance tasks for Macs completely automated for the users who choose to enable these features. This requires Mac OS X Yosemite for the Mac OS X update specific option, though prior versions of Mac OS and Mac OS X can choose to automatically install app updates if they wish (a similar, function, minus the system software updates). The rest is handled for you behind the scenes, so when an Mac OS X update arrives, say an update to Yosemite like Mac OS X 10.10.1 or 10.10.2, that update would automatically download and install itself when it becomes available. 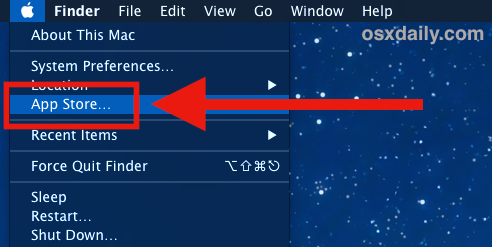 It should be noted that the automatic update check and download options are often enabled by default in modern versions of Mac OS from OS X Yosemite (and other versions of Mac OS X for that matter) onward. If you don’t want your bandwidth to be used by software updates without your own trigger of that function, you can disable them instead by unchecking the appropriate settings in the System Preference App Store panel. While this feature is not for everyone, using Automatic Updates for system updates and for installed apps is a great option for those users who are forgetful and frequently fall behind on system updates, and for those who just want an automated maintenance schedule maintained for them. For users who want to further tweak the automatic updates function, you can turn to the command line to modify how often updates are checked for from Apple servers. And if you find those software update notifications to annoy you, you can also deal with those without having to disable the update feature itself. The ability to install app updates automatically is also available to iOS, though at the moment there is not an option to automatically install iOS system updates. Many iPhone and iPad owners choose to turn off the app updating feature to preserve battery life, which is a bit more important in the smartphone world than on a desktop Mac, but power consumption would be a valid consideration for users of a MacBook Air or Pro. With Apple recent track record on buggy software releases this article should be, “How to NOT Automatically Install OS X Updates on a Mac”. This is actually a really good point. Automatic Software Updates are only as good as the software updates are, and though most point releases are big improvements and offer bug fixes, the major releases can be problematic. It would be ideal if the setting offered a “install point release bug fix updates, but not the major updates”. That could avoid a lot of hassle with problematic major OS releases that versioned as .0, and are basically an extension of a public beta. Case in point; OS X Yosemite as 10.10 is probably the most buggy and problematic OS X update since OS X Lion, particularly for novice Mac users who were not expecting the lengthy installation process, not to mention such a dramatic change UI change with the overexposure and new excruciatingly illegible font. Hopefully we don’t have to wait until OS X 10.11 for the new versions of Mac OS to be usable. In the meantime, my primary productivity Mac runs OS X Mavericks, and my secondary Mac runs OS X Yosemite as 10.10, anxiously waiting for 10.10.1 and 10.10.2 to see if it becomes usable elsewhere. Strangely enough though. I’ve not yet noticed any bugs personally with Yose. The current settings in 10.10 actually would do this. 10.10.0 to 10.10.1 is an update. 10.9.5 to 10.10.0 is an upgrade. A subtle but very important difference. I would expect that Apple will continue the current process of users (and admins) having to explicitly opt to perform a major upgrade. But there is no reason that point updates can’t be handled by the OS, particularly in situations where an Update Server has been deployed and admins are vetting releases before enabling them. This is the information I was looking for. Will this ‘Install OS X updates’ option upgrade the whole OS automatically at the first chance it gets? If Daniel is correct, it will not. App Store has always been in the Apple menu, ever since it was introduced back in the last days of Snow Leopard. 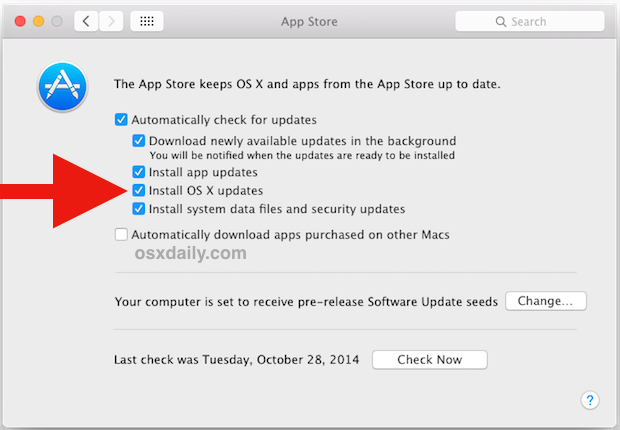 It has not replaced access to the Software Update facility that has been rolled into the Mac App Store, as clicking App Store in the Apple menu opens the Mac App Store to the Featured pane. Software Update has been moved to a button in About This Mac. When you click the button, the Mac App Store opens to the Updates pane and starts searching for possible updates. Yes true App Store has been in the  Apple menu for quite some time, but most Mac users associate software updates with “Software Update” more than App Store (same with iOS for that matter, notice how Settings > General > Software Update is the path, not Settings > App Store on the iPhone). Ultimately the updates go through the App Store, but this is a source of confusion for many. I would not be surprised that if in OS X 10.10.1 it was relabeled as Software Update, or added back as it was before. If they should get rid of anything, it’s the “App Store” menu label, since novice users do not associate that with anything other than buying apps. How have you changed the System Font? As that’s not Helvetica Neue :) where did you replace it? Better to choose manually each of available updates. I recently signed up with a satellite internet provider that allows unmetered downloads from 12-5am. Is there any way (Automator, Applescript) to have this process take place at those hours? Apple’s updates are so huge, and I only have 15GB a month to work with. Jim…have you found an answer to this yet? I’m in a similar boat. i have a slow internet connection and do not want to have background updates going at the same time my family is trying to watch something on netflix or my kids trying to do their homework. I have to say that when I bought my Macbook Pro in February last year I did so because I was tired of my Windows Laptop being so annoying and always crashing when it should have not done so. However after about a couple of months Automatic Updates on Mavericks stopped working and since then I have to manually do it. manually checking will work, just not when I turn Automatic Updates on! It will not even attempt to check! I know so by going into System preferences.App Store and looking at when it says the last check was done. That Date never changes.Even a Month Later unless manual check is made. 2. Check the WiFi settings are correct and working and all Apps including iTunes are up to date. 3. Check that the Apps etc can update manually..yes! 7. Even followed Apple’s instructions for bypassing proxy Server settings where if your Internet connection is not secure encase it goes through a proxy Server where the traffic is inspected then no attempt is made to make a check for updates. I followed all the instructions to the letter and nothing worked! I have done everything I can think of and nothing works and when I go on the Apple support forums all I get in return is told to check the settings are all on, like I am so dumb I did not think to. That is like me saying “Why won’t my Light Bulb turn on in my bedroom” and Everyone saying “Have to tried switching the switch on” ! I even delved into the System Files that deal with Updates such as /Library/preferences/com.apple.SoftwareUpdate.plist and checking that everything was there that should be. I found out that a certain key (ScheduleFrequency) should be there that was not. I added it. This Key basically tells OS X how often in days to check for updates. It still did not work. I managed to write an Apple script to do the checks for me and using Calendar automate the running the Script. This is not good enough as I want OS X to do it for me like it should. Even Windows can do updates, why not OS X? I think this issue is Apple’s fault and not mine as my Girlfriend’s Macbook Pro from the same time as mine has same problem and all the same fixes failed on hers too! I even changed to server catalogs manually and ams till seeing if that helps though I doubt it! I know that I am actually just changing the one set in Yosemite for the official one thus replacing it with itself but I investigated and found that the file that should have the key in referencing the catalog url was not there so I added it myself thinking that somehow if it was missing that may mean that no auto check is made but a manual one is! The jury is still out on that. will let you know about it! I stumbled across this thread while trying to find out how to install OS updates on my Yosemite Mac Pro without getting a *@#$ Apple ID. I don’t want an Apple ID. I don’t want to be registered at the App Store. I don’t want to put my personal data into the iCloud. I don’t want Apple to think for me. The endless explanations of the “benefits” of an Apple ID all boil down to one thing: making it easier for you to buy stuff from Apple and harder to use products made by anybody else. I just want my computer to work properly. I paid a LOT of money for this machine and its operating system, and it seems reasonable to expect Apple to provide safety updates and bug fixes without coercing me into becoming another colonist in their marketing empire. Or is that a hopelessly outmoded notion? You can install updates manually with the combo updaters, but you will not be able to install the major versions of OS X (like OS X EL Capitan) without using the App Store to download the installer. The Mac App Store and associated Apple ID functions as a login to tie your purchases together, it also works as a distribution system, much like Steam or BattleNet. This has long been the direction of where the software industry is going. iCloud is opt-in, you don’t have to use it. Automatic updates are also optional and opt-in. I would question your aversion to using logins to download things or use the internet, Apple, Microsoft, Google, Yahoo, every bank, many websites, many apps, any backup service, everyone requires a login to access your account data, that is normal, that is the internet. It would be very difficult to use the internet as anything more than a consumption engine without having a login to be able to personalize your experience. My Mac just restarted to install a beta of El Capitan, explicitly after I’d chosen “Later” in the notification. I’m fairly sure this is a bug, and fortunately no harm was done, but the only fix appears to be to turn off even the *downloading* of updates; the moment the update is downloaded, there’s a good chance it’ll get installed even if you ask it not to be.